The Nieuport 27 was a French biplane fighter aircraft during World War I designed by Gustave Delage. The model 27 was the last of the line of Nieuport "V-strut" single seat fighters stemming from the B�b� of early 1916. 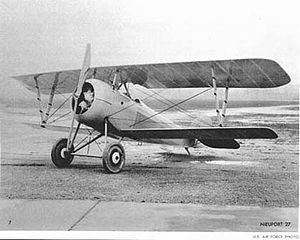 The Nieuport 27's design closely followed the early form of the 24, including its semi-rounded rear fuselage and rounded wingtips and ailerons. The structural problems with the redesigned, rounded tail surfaces of the 24, which had resulted in the use of a Nieuport 17 type tail in the 24bis., were by now overcome, so that the new version was able to standardise on the new tail. By now most Nieuport fighters were actually used as advanced trainers, and the 130 hp Le Rhx�ne Rotary engine of the 24bis. was often replaced by a 110 or 120 hp version. The handful of operational Nieuport 27s were armed either with a synchronized, fuselage-mounted Vickers machine gun (in French service) or a Lewis Gun mounted on a Foster mounting on the top wing (in British service). Two guns were occasionally fitted, but this had a severe effect on performance, which was at best little better than that of earlier models. The type served in small numbers with the French A�ronautique Militaire and also with the British Royal Flying Corps/Royal Air Force during 1917 and early 1918, supplementing or replacing the Nieuport 24bis. However, by Spring 1918 most Nieuport "V strut" fighters had been withdrawn from front line service and replaced - with SPAD S.XIIIs in French service, and with Royal Aircraft Factory S.E.5as in the RFC/RAF. The type was supplied to Italy, and built there by the Nieuport-Macchi Company at Varese, although the Italians ultimately preferred the Hanriot HD.1. Some 120 Nieuport 27 aircraft were bought for the United States Army Air Service for use as trainers in 1918. French ace Charles Nungesser was the most famous pilot to use the 27. In 1919 Poland bought one Nieuport 27. Note: Most Nieuport 27s built were used as advanced trainers, and not normally fitted with machine guns.